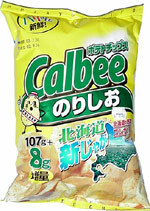 Taste test: These are large, crisp potato chips with many green specks on them. They have kind of a strange taste. You can taste the potato too, but the spices are definitely unusual ones. For our non-picky eater, they were OK, but certainly nothing special that he'd go out of his way to buy. For our extremely picky eater, they were just awful, tasting like seaweed, and he could barely eat them at all. Smell test: Smells like russet potato chips.